Get in touch with us to make your order! Cedar Shade Farm Dexters are registered in the American Dexter Cattle Association and the Legacy Dexter Cattle Registry. They are genotyped to ensure they are 100% Dexter. Our herd also carries the A2 beta casein protein, a protein found in milk. Milk containing A2 beta casein is considered to have health benefits according to a study by Keith Woodford, a New Zealand professor of Farm Management and Agribusiness. We have animals that are carriers of the chondrodysplasia gene and some that are non-carriers. All of our herd is PHA free and are horned. We sell cattle as live animals or they can be purchased as processed beef. We currently have no live animals for sale. We have live steers available for you to process for delicious beef. Cedar Shade Farm Berkshires are registered with the American Berkshire Association. In the U.S., the ABA, established in 1875, gives pedigrees only to pigs directly imported from established English herds. Pedigree ensures quality. Cedar Shade Farm does not use antibiotics to promote growth. All of our animals are raised naturally and humanely. They eat fresh vegetables and feed balanced with vitamins and minerals needed for a healthy pig. They are raised in a pen large enough for freedom of movement and plenty of fresh air. We sell the pigs as live animals or they can be purchased as processed pork. We currently have no live animals for sale. Next litter due in July. Please contact us if interested in reserving something from that litter. Please click here to contact us if you are interested in making an order. Cotton Patch Geese are a heritage breed and are listed as critically endangered by the American Livestock Conservancy. 2018 Goslings are sold. Please check here April 2019 for availability. Please click here to contact us if you are interested. The African Pygmy goat is a breed of miniature domestic goat. 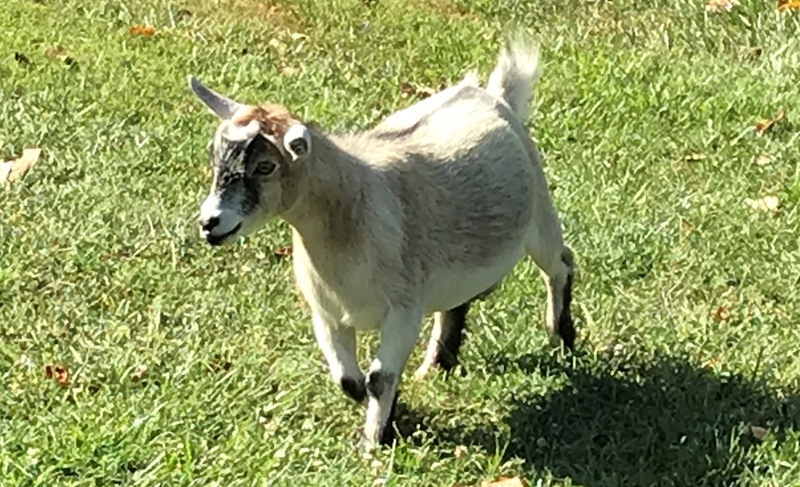 Pygmy goats are hardy and can adapt to virtually all climates. Their small size and friendliness have made pygmy goats the most common breed of goat kept as pets. Please click here to contact us and we will get right back to you. Free range hens that eat a healthy, natural diet pass on that benefit to you in their nutritious eggs. Eggs from free range hens contain less fat and cholesterol and have more Vitamins A & E and Omega 3 fatty acids.Our hens are happy roaming around the farm eating bugs and grass.Please click here to contact us and be added to the waiting list. © 2019 Cedar Shade Farm All Rights Reserved.